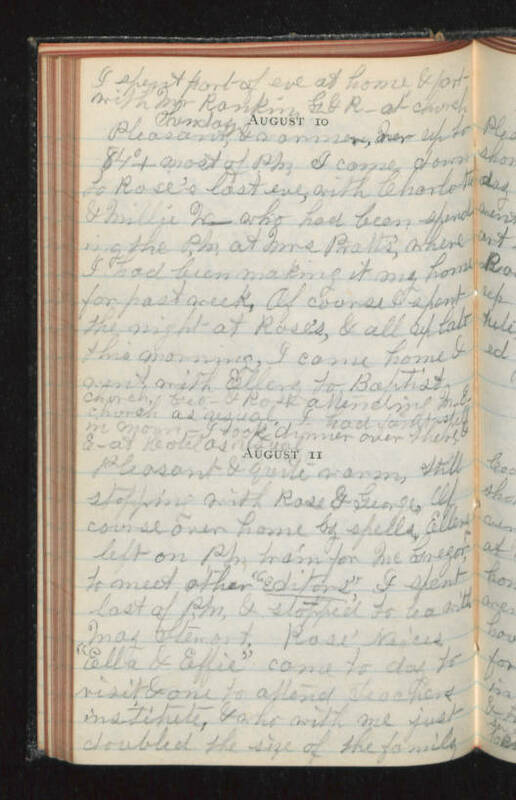 I spent part of eve at home & part with Mr Rankin G & R_ at church Sunday August 10 Pleasant & warmer, Mer up to 84°+ most of P.M., I came down to Rose's last eve, with Charlotte & Millie W_ who had been spending the P.M. at Mrs Pratt's, where I had been making it my home for past week. Of course I spent the night at Rose's & all up late this morning. I came home & went with Ellery to Baptist Church. Geo_ & Rose attending M_ E_ church as usual. I had faint spell in morn - I took dinner over there & E_ at hotel as usual. August 11 Pleasant & quite warm, still stopping with Rose & George, of course over home by spells. Ellery left on P.M. train for McGregor to meet other "Editors". I spent last of P.M. & stopped to tea with Maz Stewart. Rose' Neices "Ella & Effie" came to day to visit & one to attend Teachers institute, & who with me just doubled the size of the family.